Hands up, who enjoys feeling drained in your leadership and life? One of the things I love about young leaders, and one of the things I love about being a young church leader is that we have energy. Usually lots of it. But how many of you are starting to feel drained and tired? It may not seem like much at first, a quick nap here, a yawn there, maybe an extra hour or so of sleep. The reality is, your physical health has a huge impact on your emotional and spiritual health and soon enough your physical exhaustion will start to affect you in other ways. 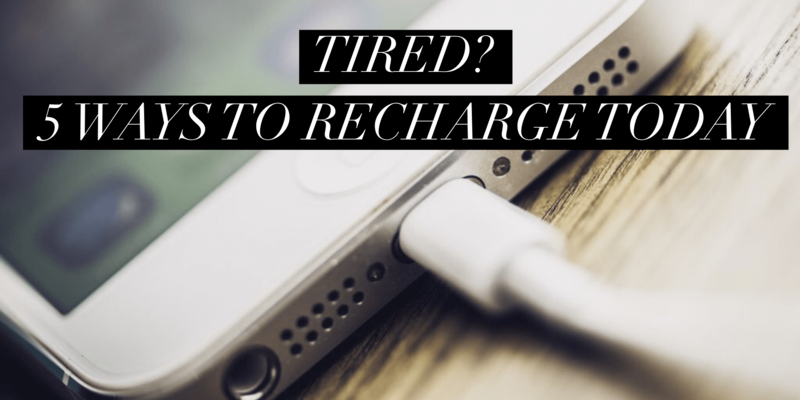 So, if you’re anything like me, and looking to recharge, here are 5 things you can do today to help recharge and find your energy and passion again. The first thing that many high-drive people do is ignore what their bodies are telling them. That’s probably the worst thing you could do. Don’t ignore the fact that you are tired, have less energy and aren’t as motivated as you usually are. It’s not a weakness in character or competency, it’s your body’s way of telling you something just might be wrong. Pushing through when you are tired may work for a short time but it is a surefire way to find yourself in deeper trouble; requiring more time, energy, and help to get back. I get it! You don’t want to appear weak. But admitting you are in need of something is the first step in getting it. What day of the week do you take as sabbath? I am usually off Saturdays and Mondays. Though admittedly, when I’m speaking Sunday, Saturday usually includes an hour or so of reviewing my message. Don’t mistake a day off as Sabbath rest. The Sabbath was a rhythm built into Israel’s weekly and yearly calendar to ensure that they rested before God. It was how God demanded Israel breath as a community and nation. Even the fields required Sabbath rest. Seriously, Leviticus 25:4. Check it out. When they forsook (yes that’s a word) the sabbath, Israel ended up in exile. And who wants that? The Sabbath is still necessary for fullness of life. The problem is that pastors often forsake the Sabbath. We aren’t great at holding ourselves accountable and often slip into habits of working on the Sabbath. I know I do. Try taking regular Sabbath rest. Set aside a day to simply be before God and see what He’ll do with that time. 3. Invest in a few key relationships, NOT everyone. I’m an extrovert. I’m married to an introvert. The one thing that we both have needed in ministry, as we have navigated what it means to be a married couple, is deep friendship with a few people, rather than shallow friendships with many people. To that end, we’ve invested in a few key relationships with family and friends and don’t try to meet with absolutely everyone in our lives. That may seem harsh, but you only have energy for a few key, deep, and meaningful relationships. You will get more energy out of those few relationships than you will out of many . 4. Try a mini vacation. Seriously, even a few days away can be incredibly rejuvenating. There is something about leaving your house, town, city, and place of work that is simply relaxing and energizing. Physical distance from your place of work, or whatever it is that is causing stress in your life, provides perspective. Try getting away, turning your email, phone, and social media off. It’s incredibly freeing. This one might seem simple enough, but there have been weeks where I’ve mistaken my message prep as time with Jesus. Just because you are reading the Bible for work, doesn’t mean it is life-giving, rejuvenating, and it doesn’t mean you are positioning yourself to hear from God. If you’re tired, chances are you’re relying a little too much on yourself and not enough on God. I promised 5 things you can try today to recharge your batteries, but who doesn’t like a bonus every now and then? For me this looks like cycling, running and working out. For others it may mean hiking, walking, swimming, or exercising. You won’t do exactly what I do, but do something to get yourself active. It may seem counter-intuitive but you will actually have more energy if you are regularly active. Your health as a leader matters. For the sake of those you lead and those you love, take care of your health. What About You? How do you stay energized, recharged, and prepared for your ministry, work, life, and leadership? Leave a comment below!